When you’ve collaborated with legends such as John Doe and Andre Williams on top of a handful of incredible alt-country and folk albums under your own name, you must be doing something right. That’s the story of The Sadies, a true band’s band compiled of the finest musicians around. 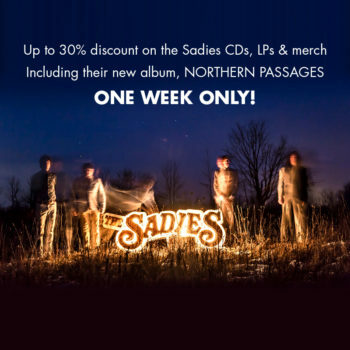 That’s why we’re giving The Sadies the spotlight this week and offering fans up to a 30% discount on all Sadies merchandise on the Yep Roc store, including CDs, LPs, and t-shirts! Their latest masterpiece, Northern Passages, is part of this sale, so don’t miss out on owning one of the finest albums of 2017. Don’t miss out, this sale only lasts a week! Josh Rouse Artist Spotlight Sale – Shop now through 10/24!